XF301 Sedum Systems are extensive green roof systems engineered to perform. A perfect pre-grown solution for retrofits and new builds. 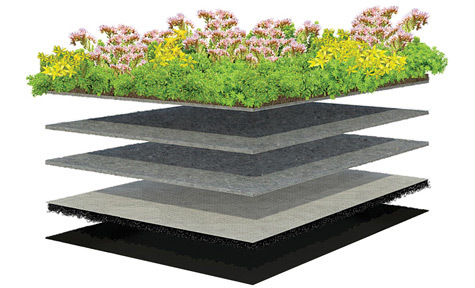 The XF301 Sedum Standard system is loose-laid and uses a low-maintenance pre-vegetated sedum mat. It provides cover and increased protection to the waterproofing membrane. Plants (up to 13 species) are grown on a "mat," harvested like sod, and installed by rolling out on top of the system's under layers. •Components come in rolls. Easy to transport, install, and maintain. •No “loose” growing medium for a clean, fast, and simple installation. •Retractable, if necessary, for easy roof access. Options for supremely effective stormwater management solutions without exerting excessive loading. Efficient water-retention layers hold 60% more rainfall compared to typical growing medium of the same thickness while remaining 20% lighter in weight. Xeroflor systems also offer a seamless integration of extensive and intensive green roof features: sedum groundcover and a custom planting option. Varying depths of growing medium create topographic variation and increased biodiversity. Independently tested. Fire, wind, and root-resistant. CAN/CSA-A123.21-14 Standard test method for dynamic wind uplift resistance of vegetated roof assemblies. The advantages of a built-up roofing (BUR) assembly include long life, a variety of maintenance options, and outstanding puncture resistance. Use of two-pound, medium-density closed-cell sprayed polyurethane foam (SPF) is growing rapidly in commercial structures. Utilization of the material has been fuelled in large part by its ability to seal the structure and, in doing so, tremendously enhance energy efficiency.